They are made from #316 (18/10) food grade Stainless Steel, (The best of the best!) and the lid has a silicone seal. The containers are completely air tight. 140 mL. 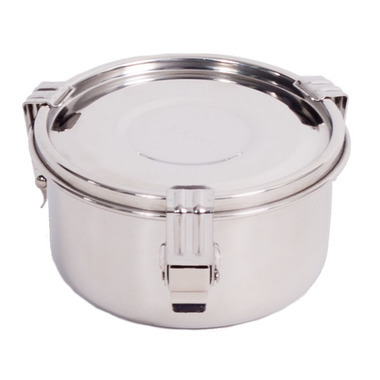 Excellent quality stainless steel, and a good seal keeps liquids from leaking. I use the 8cm size to pack a snack for work. Grapes and cheese, chips, pretzels, yoghurt and fruit, overnight oats, etc. I was so impressed with this product, that I purchased the product in all sizes that well.ca carries. Great container for berries and other snacks. Leak proof, well made and stylish and a great addition to a zero waste kit. It's a perfect size for a snack and doesn't open in my bag. Excellent seal and lightweight. Rust and sharp edges though where the arms are welded to the container. arrived on time. it's air tight and works as intended. Great small container. Perfect for toddler snacks. Fits 3 mini muffins or yogurt, fruit and granola perfectly.